All of the student murals are being painted over at school. I walked in last week and right away came upon one being painted over, so I took this photo with my iPad. It took my breath away. 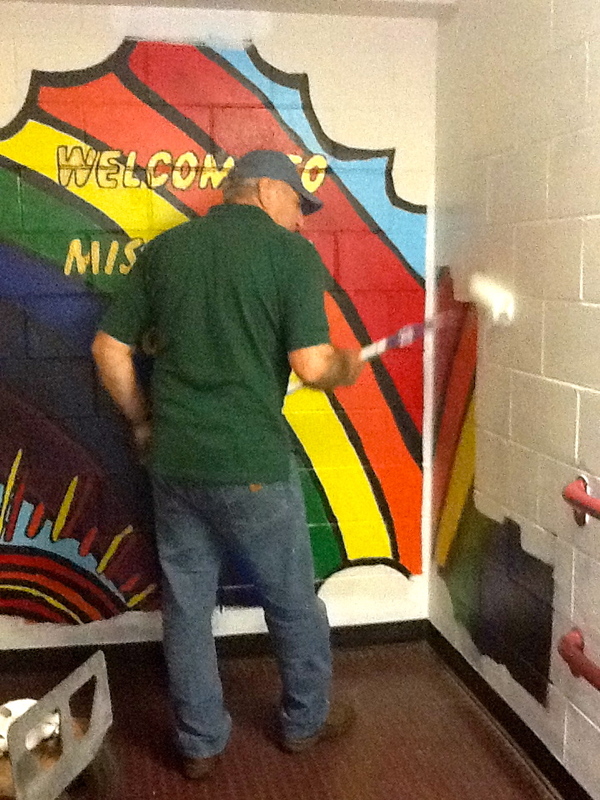 I remember the countless hours spent by so many students as they painted the murals. Somewhere between 300 and 500 students have worked on the murals in the school, and I can pretty much remember every session of painting. Students designed the murals for particular spaces in the building usually around a theme or concept. They were all wonderful and very colorful. The murals are being erased in order to spruce up the hallways as part of a facelift project that we are lucky to get for our school. We are getting a new roof, new boilers, and new gym windows. These are much needed improvements in our school. Clean, white hallways will go a long way in making the inside of the school look good. We are ordering large wooden display frames for strategic spots in the school. We will be able to hang student work in a neat, safe, and protected way. We will also be able to change the displays whenever we want to. I will keep you posted when our first displays go up! To see a series of posts about the many student designed and painted murals formerly at Miscoe Hill school, search Murals in the categories search on the front page of this site. This makes me sad. I remember when this was done at a high school on the eastern shore of MD. A new principal. Marking the territory. Eeesh.